This Private Tour covers the topic of love, and particularly love gone bad. We uncover compelling stories on our walking tour that are dark and funny stories about love, lust and betrayal plucked from New Orleans history. Your guide will share rich and heroic stories of some of the most famous and influential women of New Orleans, and how they became so famous or notorious and carved out the rich southern society that still exists here. You'll learn of Marie Laveau, the Voodoo Queen, Henrietta Delille, Loretta Velasquez and Madame Pontalba, and many more women who lived famous lives and were heroes of feminism and bravery. This tour includes a fun air conditioned bar stop (or two) along the way. Specialty frozen (Brandy Alexander) and cocktails available for purchase on bar stop. Your walking tour begins in the French Quarter. The stories you'll hear are dark and funny, and rich with themes of revenge, lust and living well. Your guide will share stories of arranged marriages, elopements, Creole courtship, and heroines like Madame Pontalba, Loretta Vasquez, Henriette DeLille and much, much more. Your tour ends near Golden Lantern on Royal Street, where you can enjoy their free cabaret show (Friday and Saturday nights 9pm, Sunday cabaret show begins at 5pm). 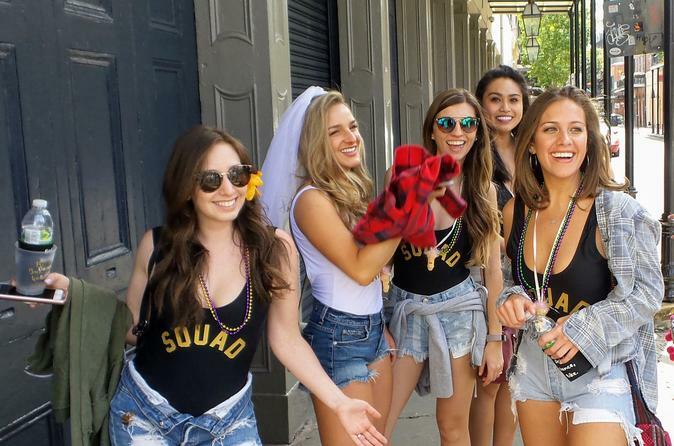 This tour was designed for your bachelorette party in mind. The stories are fun and dark and this is great for a day or a night tour. Lots of girl power! Special Offer - Book and save 27% compared to the local supplier's prices! - Book Now!